I’ve broken all the rules (again) by not saying much about the re-release of my first published book under a new name. (Getting the flu and dealing with some other ‘life interruptions’ will do that sometimes…) BUT HERE IT IS! 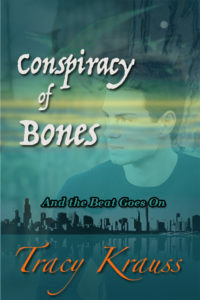 CONSPIRACY OF BONES is out in all ebook formats and available everywhere ebooks are sold! Yup. This is the recently revised and re-published version of my first published novel AND THE BEAT GOES ON. (Only with a new name. No more ‘Sonny and Cher’ references!) I received the rights back to this book last year but have finally just gotten to getting it prepped and ready for re-publication. It’s the same gripping story, but with significant improvements. (At least in my mind.) I’ve learned a few things in the past eight years since it first released and I’ve grown as a writer, so I knew that when the time was right, I wanted to revise and re-release it. Canadian born archaeologist Mark Graham unearths a remarkable discovery while at a dig in the mountains of Zimbabwe – pterodactyl remains and giant human bones buried together. Speculation leads to the possible existence of a mythical race known as ‘Nephilim’, a pre-flood people alleged to have descended from both gods and men. But skepticism and sabotage delay Mark and his team as the dig site is compromised, putting their discovery – as well as Mark’s very life – in grave danger. Deceived and framed by trusted friends and colleagues, Mark struggles to safeguard his findings and protect his reputation in order to unearth the mystery behind the bones.